IT’S AS SIMPLE AS 1 2 3! With parties in soft play centres generating over 30% of their total revenue, it is imperative that each party is maximised to their full potential. What better way to market your business to first time customers with engaging and unique branded party bags? 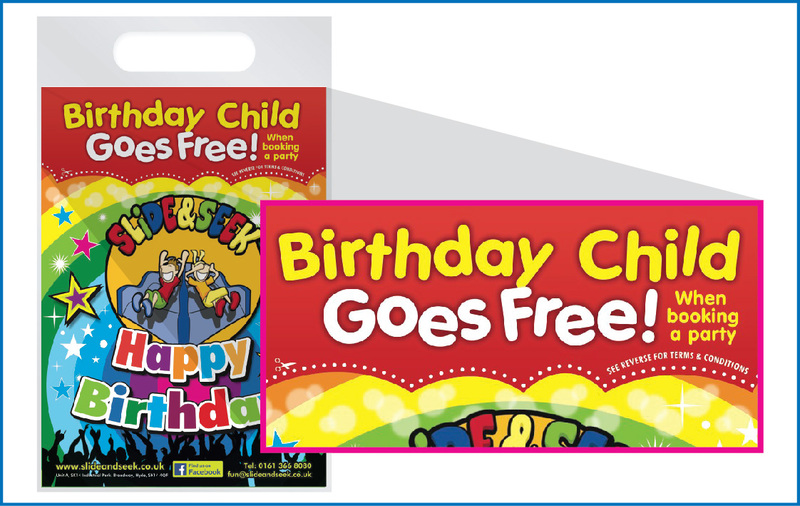 We work in partnership with our clients on an individual basis to create branded party bags that reflects your branding and company image, tailored to your budget and with our unique voucher code area, we provide a fantastic opportunity to market to all of the parents of every party goer. Our clients have all found the voucher code area successful and have generated extra revenue in various different ways. As this party bag is unique to your business the design can be changed including the vouchers and offers. Target off peak periods when your centre is quiet by offering your customer discounted entry or an incentive to return. Encourage the parents of all those party children with a party booking offer to maximise your booking potential. Encourage visitors with a focused offer so that first time customers become returning customers. This is a great way to capture information about your customers, and increase your database. Say goodbye to those generic party bags and let us help you maximise your party potential. All clients have different requirements and we offer all our services with a personal touch to ensure you receive a unique product that is suited to your business. Engages the child – Parents get an offer – You get your branding! Don’t delay and contact us today and let our branded party bags help you maximise your party potential.